Clicking on the “Exchanges already taking orders” pdf box at the bottom of THIS PAGE shows Kemnay as “Available”. 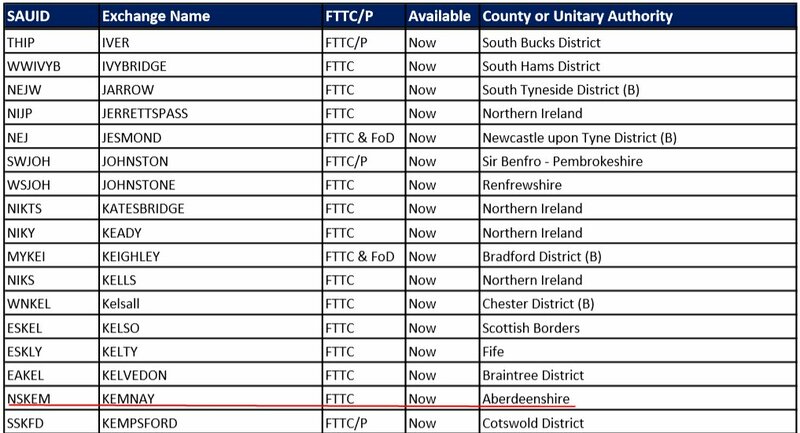 However, on 12/10/2014 I was advised that the exchange is enabled for FTTC but the cabinet serving Kemnay lines is not yet enabled. I will however be monitoring the situation. Lots of service providers offer superfast fibre broadband for homes and businesses, often bundled with phone and TV packages as well. Check out the deals they have available on their websites, there is a list of some of the more popular ones HERE but it is not a complete list so check with your own ISP also. Fibre To The Cabinet (FTTC). Superfast broadband is one of the names used for the next generation of broadband. It’s also sometimes referred to as “faster broadband” or “next generation broadband”. It differs from basic broadband in that it is much faster in terms of the data it can transfer. Imagine it as being a bit like a water pipe where a big water pipe can carry more water than a thin one. So, if you have superfast broadband in your home or business, it’s much easier to perform tasks that involve a lot of data – like watching films or transferring large files. Superfast broadband is spreading across Scotland! Improving the quality of online experiences and supporting exciting new developments in internet services, it can bring a host of benefits and opportunities to both business users and home users. Can I get Superfast Broadband? How do I know if I can get superfast broadband?